Hot on the heels of the official retail availability (and now non-availability) of the Nexus 4, Nexus 10, and Nexus 7 3G, Google has updated the Android Developers Nexus images page with brand-new builds based on Android 4.2. 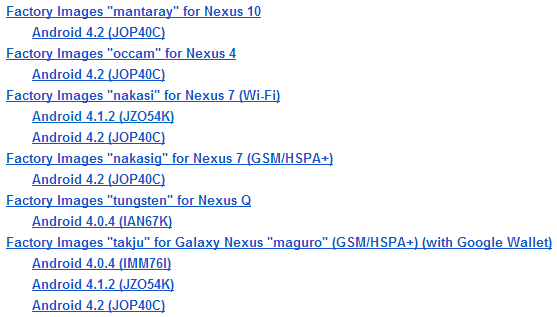 The images, for now, are limited to the Nexus 10, Nexus 4, Nexus 7 (Wi-Fi and 3G), and Galaxy Nexus (Takju) Play Store variants. In addition, driver binaries for the aforementioned devices (except the Nexus 4 / Nexus 7 3G) and more have also been posted here. Of course, in more exciting news, Android 4.2 has also just been released to AOSP - so hit up our post (here) for the latest, up-to-the-second info.